Nothing sends a household into a tizzy like hearing the phrase, “let’s redo the floors”. No doubt about it, flooring is a big-ticket item, one that can add value and appeal to your home. 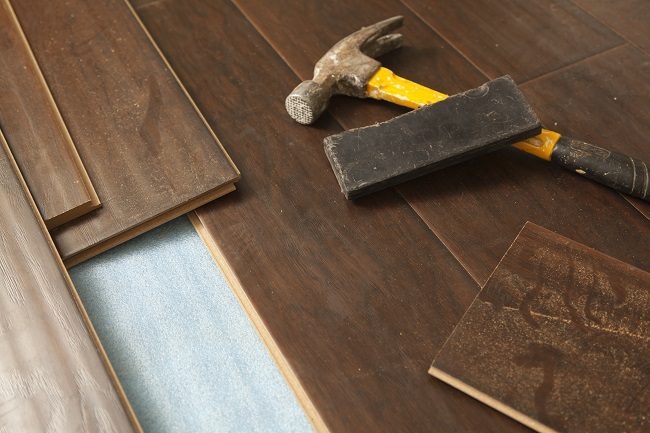 If you are looking for a transformative DIY project this year, consider replacing your floors. What is Your Floor Telling You? How do you choose the best flooring material for your home? By listening to what your floor is telling you. Take the time to look at your floor. Where are the problem areas? Are you replacing it for aesthetic reasons or because it wears in certain places? There are pros and cons for each flooring product, so assess your needs and make the right selection. Foot traffic – Find the wear patterns on your floor, then decide on a durable material for the entire house or different materials in rooms with less traffic. Insulation – You may hate carpet but it does keep the floor warm in the wintertime. Hardwoods are less insulating and will amplify sound throughout your home. Sunlight – Direct sunlight can discolor and break down flooring like carpet fibers. Look for products with UV protective coatings or materials. Overall use – If you have kids and pets, your floors get cleaned a lot. Select materials that don’t require special care and can tolerate spills. Allergy protection – Carpets trap dust, mold and pet dander, so avoid them if someone in your house has breathing sensitivities. If it has been a while since you shopped for flooring, the options available will surprise you. From exotic hardwoods and laminates to vinyl that looks like tile and tile that looks like wood, your choices can be overwhelming. Solid wood – Still one of the most popular choices, hardwood flooring is durable and can be re-finished. Buy pre-stained boards to make installation easier. Engineered wood – A veneer of real wood is applied to a plywood center. While cheaper than hardwoods, they still dent easily and scratch. Depending on the thickness and quality of the top veneer, the boards can be re-finished a few times before needing to be replaced. Laminate – It has a photographic applique over a plywood center. Laminate is easy to install, resists stains and is now available in waterproof versions. Unlike engineered wood, its veneer cannot be refinished. Vinyl – Durable and easy to install, vinyl is one of the least expensive materials to use. It comes in sheets, tiles and planks and is great for high traffic areas. Linoleum – This eco-friendly alternative to vinyl can take a beating and is pet-friendly. Made from solidified linseed oil, it contains no harmful VOCs (volatile organic compounds). Available in sheets or rolls, linoleum has a life span of 20-40 years. Carpet – Stain-resistant, insulating and durable, it is still an economic option for homeowners. Not a good choice for allergy sufferers, though. Ceramic Tile – Great for areas that take a lot of abuse. While a very durable material, installation requires accurate measurements, cutting and grout protection. Selecting one material to use throughout your home may not be feasible. That’s OK! Designers are mixing flooring from room to room and even in the same room. Find what works for your family’s lifestyle and go for it. Your feet and your home will thank you. From flooring nail guns and sanders to linoleum floor rollers and tile cutters, our expert staff is always on hand to help you find the right equipment to handle your flooring projects. Just want to re-finish the wood floors you have? Our blog, What to Remember When Refinishing Your Hardwoods, has great tips to help keep you on track. As always, if you have any questions about what to choose, pricing or how-to’s, don’t hesitate to contact us. Stop by our store — we’re open seven days a week.